Here’s your chance to say anything you like about the first book in the Vision of Shadows arc. If you haven’t read TAQ yet, look away now. The warning in the title of this post! That would be interesting. But who knows if Bee, Slash and One Eye were still around, since Maggottail was stated to be the oldest DF member. Kate, do Twigkit, Violetkit and Needlepaw have long-fur or short-fur? By “always” do you really mean only the cats specifcally said to have long fur really have long fur? All cats said to have thick fur, or where nothing is stated about the fur-length have short fur? In my imagination, yes. Other Erins may differ. But thick fur is thick fur as far as I’m concerned. Long fur is long fur. Just as thick hair is thick hair and long hair is long hair. Kate can you tell us what happened to Egg???? Egg was the biggest beauty in all of Skyclan lol. He cant be dead.. Which books did Egg appear in? Why do I not remember him? Egg! Awesome! I hope it was an eggciting eggventure! STOATKIT THE SHINY ESPEON WHO HAS HER 1-YEAR BLOGCLANNIVERSARY TOMORROW! He appeared in SkyClan’s Destiny and joined SkyClan, but he didn’t appear in the SkyClan and the Stranger manga. Egg was a rogue that joined SkyClan towards the end of SkyClan’s Destiny. He was adult age, I believe, but he was made Sharpclaw’s apprentice. He requested not to take a Clan name, as he preferred to be called Egg, and he asked to join the patrol helping Stick attack Dodge’s cats, because he wanted to prove his loyalty to SkyClan. However, Egg never appeared in any SkyClan stories that took place after that book. We never saw him in the SkyClan and the Stranger mangas, or in Ravenpaw’s Farewell, he was never even mentioned. When Vicky was asked about it a while ago, she responded that she thought he became a warrior of SkyClan, but always with a loner’s perspective on Clan matters. I always did wonder why he never showed up again, and I wonder whether he’ll show up in A Vision of Shadows since SkyClan features more heavily now. We clearly need more Egg. Nice idea! But I doubt if we’ll ever wander far from ThunderClan…but never say never…. Oh OK and also if fire paw didn’t leave and stayed as a kitty pet how wold everything change ? Fire wouldn’t have saved the Clan…. Oh and also crookedstars promise is one of my faves ? Egg appears in SkyClan’s Destiny. He is a loner passing bye and liking SkyClan, so he is made Apprentice of Sharpclaw. Leafstar wants to give him the name “Eggpaw” but he requests to just keep his name and is still calles “Egg”. At first they are sceptical if Egg will really fitt into SkyClan, but later he prooves himself by hunting and fighting with the Clan and Leafstar is glad she took him in. Thanks. A Cherith book. Which explains my ignorance! Kate, in the original allegiances for The Apprentice’s Quest you put on your original blog there was a WC she-cat named Ferntail who was listed as Crowfeather’s apprentice. She was a gray tabby she-cat and stated to be Sedgewhisker and Emberfoot’s kit. In the finished allegiances Ferntail was gone and replaced with Fernpaw, who is a dark brown she-cat. She is Crowfeather’s apprentice as well. So, are Ferntail and Fernpaw the same cat, but just with different appearances? It would make sense. After all, Jaywing was changed to Jayclaw and Stonetooth was changed to Stonewing. She is the same cat; we just altered her name to reflect her apprentice status. Thanks! c: I guess I know what Fernpaw’s warrior name is, then. *Takes editor head off and puts motherly head on* Go to sleep! Allegiances can wait! Tui writes all the WoF books. its her series. Darkest Night? That sounds awesome! Ooh, why so dark? SkyClan going RIP? Crookedstar gets one of his lifes from a male apprentice called Lightningpaw. What do you think did he look like? And when Crookedkit runs away because he broke his jaw he comes to live with a tom called “Fleck” that teaches him how to eat and hunt properly with his jaw. Fleck tells him that a tom named Domino, who was kin of him, also had a broken jaw. I can’t remember! It was a long time since I wrote the book, but I’m guessing Domino was a black and white cat. Can you imagine descriptions for the others? I think Lightningpaw was a golden tabby tom and the stripes were a little sharp like lightning and the golden colour would also fit his name. Black and White fits Dominos Name so good! Do you think he is the brother of Fleck? It would fit so well! I can’t say for sure if he’s Fleck’s brother, but let’s imagine he is for now 🙂 And your description of Lightningpaw is fabulous! 😀 Love it. has Hawkwing’s Journey been written yet? If not can you tell Cherith to put Egg in there lol. It’s so sad that sandstorm dies but at least she can be with firestar! Why won’t Sparkpaw’s warrior name be Sparkfire?! 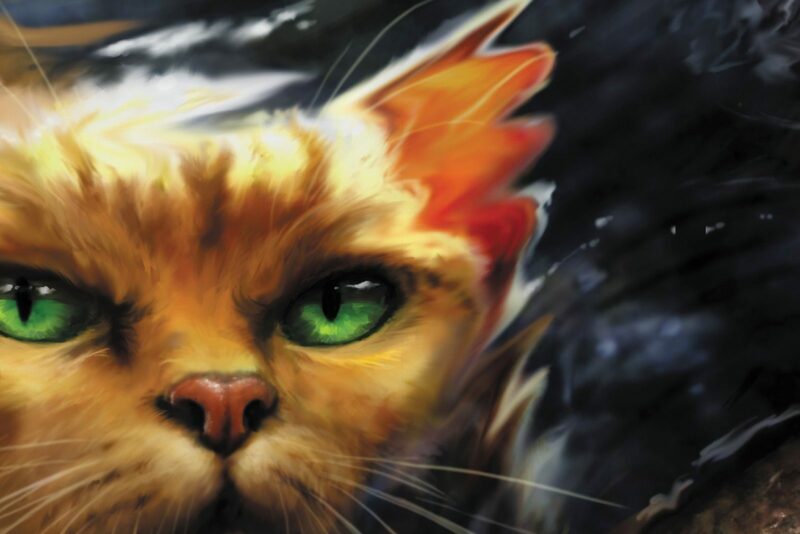 I read in the book that Sparkpaw looks really similar to Firestar, and I immediately thought that she should be Sparkfire in honor of Firestar! HarperCollins rejected the name. No clue why though. Probably because it was redundant. I love the suffix -fire, but Sparkfire just sounds, as I just mentioned, redundant. I mean, imagine cats with names like Icefrost, Roseflower, Oaktree, etc. Hey Amber, I was reading a fanfiction called Blue Moon on Fanfiction.net and one of the reviewers was Amberstorm233! Was that you? Yup. On deviantart and other mediums, I’m Amberstorm233. SparkFire is a name of some company. 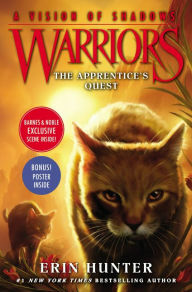 Welcome to the Warriors Discussion Page/ Ask Kate Questions Page!